If you grew up in or near the Southbay, 1590/KLIV was probably your station of choice for Top 40 music, great personalities — including John McLeod, Dave Sholin, Bob Ray, Jack Hayes, Ross Macgowan, Ralph Koal, Scott St. James, Ray Morgan, Mac McGregor and the inimitable Captain Mikey (Mikel Hunter Herrington) — as well as for promoting concerts at the San Jose Civic Auditorium and other local venues. KLIV got its start in September 1946 as a 1000-watt daytime-only station known as KSJO. Its sister station, KSJO-FM (92.3), made its debut in December 1946 from shared facilities in the Austin Field-designed studios at the corner of Story Road and Lucretia Avenue in rural San Jose. In 1947, KSJO-AM added nighttime service at 500 watts. The original owners of KSJO sold the AM to Cal-Radio, Inc., owned by Riley R. Gibson, on June 1, 1960, at which time it became KLIV. (The FM retained the KSJO call letters.) In 1961, KLIV’s daytime power was boosted to 5,000 watts; nighttime power was raised to the same level in 1969. On July 1, 1967, was sold for $974,000 by Cal-Radio to Empire Broadcasting, owned by two former Rochester, N.Y., radio executives, Robert S. (Bob) Kieve and James M. Trayhern, Jr. The new owners inherited a program director who became a legend: Mikel Hunter Herrington, who had converted staid KLIV from a mere Top 40 also-ran to a solid contender against stalwarts KYA, KEWB and KFRC. Positioning KLIV as a “surfer station” — emphasizing the music of the Beach Boys, Jan & Dean, the Surfaris and other stars of the genre — and tying in promotions (such as providing listeners with hot dogs, buns and soft drinks for weekend Surfin’ Safari-style caravans over Highway 17 to the beach at Santa Cruz), Herrington, who took to the air as “Captain Mikey,” helped the station successfully compete for the ears of youthful listeners and the dollars of prominent local advertisers, such as Goodies Speed Shop and Courtesy Chevrolet. One measure of success in the 1960s was the sheer number of teenager-driven automobiles adorned with round KLIV decals depicting the station’s snooty surfer boy, Norman. Devised by Herrington as the station’s mascot, Norman was also the star of the KLIV 20/20 Music Surveys, available at record shops and variety stores throughout the Southbay. Following Herrington’s departure — he later pioneered album-oriented rock formats at San Jose’s KOME and Los Angeles’ KMET — KLIV battled through the 1970s with variations on Top 40, Rock and even Disco-flavored formats, then switched to the syndicated “Music Of Your Life” Adult Standards format in May 1981. Early in 1991, KLIV moved to an all-news format, mixing local coverage with network audio from CNN Headline News. At a time when KYA, KFRC and KEWB garnered much attention in the Bay Area, KLIV meanwhile attracted its fair share of dedicated listeners. Join us for a look (and listen) back at the remarkable station on Story Road. Via James Zahn, a rare and interesting clip from the first Saturday in the life of KLIV, which had only days earlier come under new ownership, sold by Patrick Peabody’s Santa Clara Broadcasting Company to Riley R. Gibson’s Cal-Radio, Inc., and changed call letters from its original KSJO. The transaction, valued at $350,000, had been completed on June 1. The character of “Mad Mel” is obviously a broad parody of a prototypical Top 40 disc jockey … but who from KLIV’s staff was playing Mel? A brief sampler of seven different KLIV jingles from the mid-1960s, including selections from the PAMS Bandapellas and Series 34A packages. For more KLIV jingles, please visit our Jingles page. A package of six “Capt. Mikey” jingles (a few repeated) from KLIV, probably dating from 1966 or 1967, from Mikel Herrington’s personal collection. A note written on the tape label notes “(John) McLeod has masters.” Courtesy of Janet Herrington. From a reel of tape belonging to Mikel Hunter Herrington comes this choppily-scoped recording, which runs the gamut of audio quality from horrible to quite good. Dating from the last week of December 1966 through the first week of January 1967, it begins with a fragment of Grant Plummer, followed by several chunks of KLIV program director Herrington in his Captain Mikey guise. 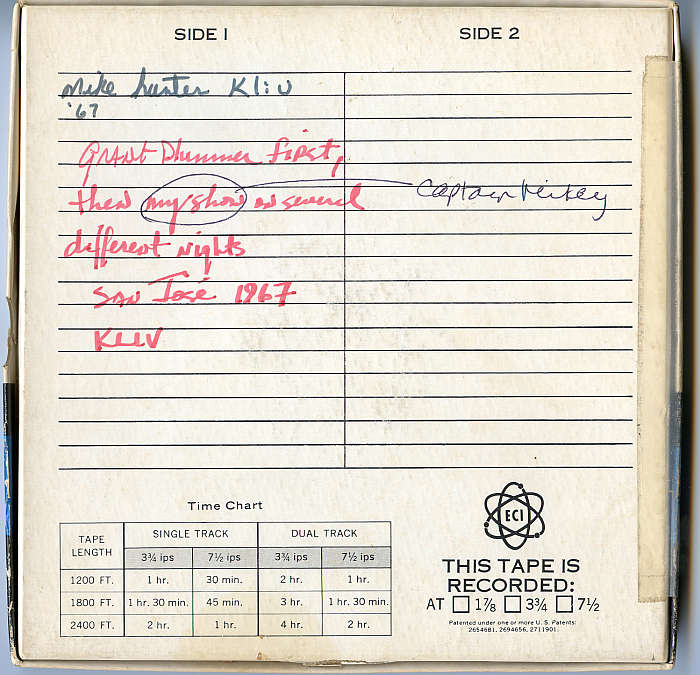 The tape box containing the reel included the following text: “Mike Hunter KLIV ’67. Grant Plummer first, then my show (Captain Mikey) on several different nights. San Jose 1967 KLIV.” (Based on audio clues, part of the recording obviously dates from late December 1966.) Courtesy of Janet Herrington. Including a news report with George Sampson and sports commentary from Dan Hruby. A twenty-year tradition of playing rock’n’roll hits comes to an end as the station reluctantly changes to Big Band music and Adult Standards. Includes comments by John McLeod and KLIV owner Bob Kieve. — Exhibit includes text and audio. — Exhibit includes audio. DB — Courtesy of Dave Billeci. GS — Courtesy of Gary Seger. JH — Courtesy of Janet Herrington. JZ — Courtesy of James Zahn. KV — Courtesy of Kim Vestal. MS — Courtesy of Mike Schweizer. Special thanks to Steve Hilson for his production assistance on the audio exhibits included in these exhibits.